Doug Stanhope came to Bangkok on March, 17th 2018 at the Westin Hotel on Sukhumvit 19. I’ll be writing about the show at a later date. This Thursday, April 5th, 2018 comedian and musician Bill Bailey will be flying in for his comedy show at the Westin. Doors open from 6:30. Show starts at 8:00. Top flight comedians are like watching X-Games performers. They do things people would like to do but are incapable of. Support the live arts when you can, ladies and gentlemen. Life is short and in the long run we are all dead. 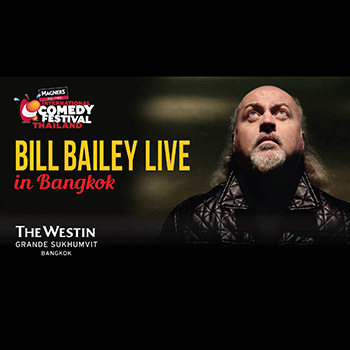 Bill Bailey tackles politics, philosophy and the pursuit of happiness Thursday, April 5th at The Westin Hotel on Sukhumvit 19. The artist has said he will grant permission to use his identity as soon as I give him the tools to craft a humorous panel. That was three years ago. I’m still waiting to hear back from him on this one. Where’s Gop you say? He’s there for the true fans.